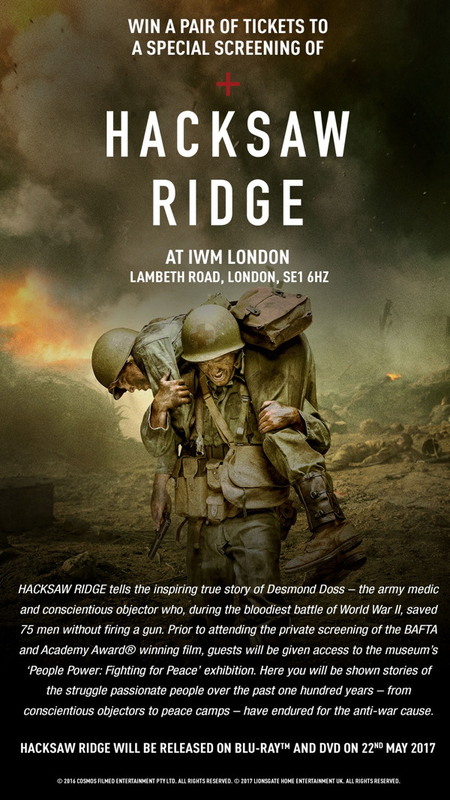 We've got three pairs of tickets to a special screening of HACKSAW RIDGE at IWM London to give away to SE1 readers. Just answer the simple question below for your chance to win. All entries must be submitted via London SE1 website. One entry per person permitted. A winner will be chosen by random draw on 16 May 2017. The winner will receive a pair of tickets to attend the HACKSAW RIDGE screening at London's Imperial War Museum, Lambeth Rd, London SE1 6HZ on 18 May 2017 at 18:30. Transportation to and from the Imperial War Museum is not included. The winner will be notified by e-mail (using details provided at entry) on 16 May 2017 and must respond from that e-mail address to claim their prize. If a winner does not respond to the Promoter within 1 day of being notified by the Promoter, then the winner's prize will be forfeited and the Promoter will be entitled to select another winner in accordance with the process described above. The prize will be confirmed via e-mail by the Promoter to the winner within 1 day of being notified of their win.